It all began for ‘The Italian Stallion’ in 1994 when he started doing the graveyard shift on 5FM, which he did for two and a half years, finally filling in on the night radio slot in October 1997. The rest, as they say, is history. Sasha Martinengo was 5FM’s longest-standing DJ with a fan following that spans many different age and ethnic groups. Right now, Sasha is living his greatest dream in the industry that he has devoted his life to radio and of course - to Formula 1. Sasha was the first ever DJ in SA to have his own website and the first to have an email account on air. 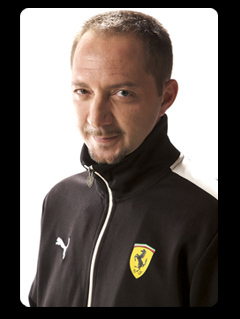 Being a major force in the world of F1 in South Africa, Sasha also had his own F1 website back in the late 1990’s but the work load got too much and resorted to just sending out a daily F1 blog. They weren’t called blog’s then, just newsletters. Sasha also broadcast the first ever show in the world via Skype. He was forced to do that due to technical problems but the show was done from the Seychelles and it proved to be a hit with the listeners. Having travelled to many F1 Grands Prix, Sasha is a household name in South Africa on the subject of Formula 1 and has been the anchor for F1 on Supersport since 2002. Sasha has released a few of his own dance compilations namely, Sasha’s Essential Hit Picks and Sasha Martinengo vs. DJ Decks. The first 3 compilations have sold close to 100 000 copies showing that Sasha has his pulse on what his listeners want to hear when they are not listening to the radio. After leaving 5FM in April 2012 Sasha teamed up with Darren Scott and Gearz Visual Radio and now hosts his own show called Gearz. It’s a music and motoring show with the main emphasis being on motorsport. Sasha hosts another show with Ian F from 2pm to 3pm, called the 1F & F1 show. He is also a contributing writer for F1 Racing Magazine, South Africa.